Because I work at a public library in Arizona, readers are always looking for mysteries set in the state. I read Sinclair Browning's Trade Ellis books before I ever moved here, and I don't hesitate to pass them on. The biggest disappointment is that there are only five in the series. 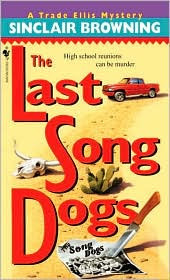 The Last Song Dogs came out in 1999, and was a finalist for the 2000 Shamus Award for Best Paperback. It introduced Trade Ellis, a rancher, a "dirty-shirt cowgirl", and a part-time private eye. She's part Apache, and spends her time working her ranch, Vaca Grande, trying to supplement her income with her private investigation business. As her 25th reunion from Javelina High School approaches, she receives news of the gruesome murders of some of the cheerleaders. Trade, herself, is one of the few remaining cheerleaders, but two others hire her to stop a killer before they end up as the next victims. A class reunion is a perfect time to interview suspects, or point out the remaining cheerleaders to a killer. The Sporting Club, the second book in the series, was a finalist for the 2001 Shamus Award for Best Paperback. Three more mysteries followed: Rode Hard, Put Away Dead; Crack Shot; and Traggedy Ann. In just five books, Sinclair Browning gave us intriguing Arizona mysteries with a hard-working rancher/detective. It's a fascinating life, when you only have to read about it. It's just too bad there were only five books in the series. And, for other Friday "Forgotten" Books, check out Patti Abbott's website at www.pattinase.blogspot.com, where she summarizes all the suggestions for Friday. The Last Song Dogs by Sinclair Browning. Bantam Books, ©1999. ISBN 9780553579406 (paperback), 272p. Thanks, Lesa. A truly unknown book and author for me. You're welcome, Patti. And, this time, I remembered to link back! Sorry about that. Thanks, these sound great. I'm always looking for other local authors besides J.A.Jance, and how could a book go wrong that features Javelina High School?!!! They are good mysteries. And, like you, I'm always looking for mysteries set in Arizona and the southwest. You're right. And, don't you feel a little special knowing what a javelina is? I loved this series and really wish there were more books. Me, too, Pat. Thanks for telling others you loved them, too. I happened on to these books a little more than a year ago. Three or four of us from DorothyL mailed them back and forth as we found them all. I too am sad there aren't more books in the series. And, I don't really know what happened to this series, or Sinclair Browning. It's just too bad the series is over. Oops, don't know if I'm posting twice. Thanks, Lesa, for the kind mention which I've just now found. I'm still writing. With legacy publishing so tight I've ventured into ebooks. Who knows, maybe there will be a 6th Trade Ellis adventure!